As HOA industry professionals, there are many positive aspects to our occupation. We work with a diverse group of people, take fulfillment from helping volunteer boards, and are happy when we solve problems through creativity. Unfortunately, there are situations that can become difficult. Most association managers (“Manager”) have had some experience dealing with abusive homeowners and demanding board members (“Hostile Actor”). Typically, the Hostile Actor exhibits unrelenting behavior that becomes obnoxious despite Management’s best efforts. The purpose of this article is to provide Managers with a brief primer as you experience hostility in the moment – via email correspondence, telephone calls, or direct confrontations. “Thank you for your email. The board values resident communication relating to Association business. I understand your concerns and will forward your communication to the board for review at the next board meeting. A phone call is usually the next step if the Hostile Actor is not satisfied with Management’s return correspondence. You should be able to tell where the call is headed based upon his or her initial tone and word choice. Hostile situations may be diffused or avoided altogether by giving the caller a chance to be heard; the Manager can use the call for good as an opportunity to further explain why it would be inappropriate and unfair if Management were to respond at that time. You do not deserve to be the subject of personal attacks. Phone calls that lapse into volatile language should be ended as soon as possible by stating that all future communication must be sent in writing for board review. After the call concludes, it is advisable to send an email to the Hostile Actor which politely confirms your prior statement about future communication. If possible, the Manager should prepare an internal memo which documents what was said with as much detail as possible. The memo can be used to notify other Management employees regarding the Hostile Actor’s prior phone call and for evidence preservation purposes. Preserving inflammatory communication can help general counsel with later drafting cease and desist correspondence and, if necessary, filing a temporary restraining order if abusive behaviors later escalate. With limited exception, there is no need for in-person meetings between Managers and Hostile Actors who have demonstrated a prior pattern of disruptive conduct. In general, Hostile Actors do not show up at Management’s business office unless they are angry. For that reason, direct confrontations, which are rarely productive, are not recommended because of the potential for further abuse. Management’s receptionist, if available, should screen the reason for the visit and then direct the Hostile Actor to forward his or her concerns to the board in writing. If a Manager interacts with a Hostile Actor, then all meetings should be held in the open presence of at least one (1) other Management professional so that conversations can be witnessed. One-on-one meetings in a private office are discouraged. What happens when the Hostile Actor is a board member? Management’s executive team, if available, should be contacted for assistance to navigate the delicate client relationship. The board member should be reminded that your ability to support the Association depends upon establishing a professional working relationship. The appearance of the Hostile Actor at board meetings is not uncommon. 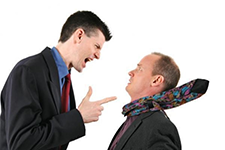 The Manager can reduce the possibility of hostile meeting environments by being proactive. Distributing policy statements for board meeting conduct and requiring the completion of homeowner speaker cards are effective ways to create a healthy work space. Those documents can state that homeowner forum will be time limited and interruptions will not be tolerated, among other things. Unruly board members may be tempered by emphasizing the importance of only discussing agenda items and underscoring the negative consequences to the Association by engaging in harmful dialogue. The Hostile Actor is a frequent character in the business of managing community associations. Disruptive situations should be identified and handled swiftly by the board and Management on a case by case basis through a collaborative process. The Manager should consider contacting ‘legal’ if abusive communication intensifies. General counsel can then offer potential solutions for board review such as sending cease and desist correspondence, initiating the Internal Dispute Resolution process, or seeking judicial relief. -Blog post authored by TLG Attorney, Kumar S. Raja, Esq.